Fall is by far my favorite season. I love the crisp air, the chilly wind rushing through the treetops, and the brightly colored leaves littering the ground. Crunching through the leaves on a cool afternoon bundled up in a cozy sweater and looking forward to a hot cup of cocoa is probably one of the best feelings in the world. Especially since fall also begins the holiday season with Halloween (my favorite holiday) and Thanksgiving. There are dozens of decorations to choose from to celebrate the passage of time, including pumpkins and gourds, scarecrows, and leaves. If you want fall decorations that are both timely and tasteful, you might want to take a look at this free pattern for knitted leaves. You can make them any size and use them for placemats, coasters, napkin rings, centerpieces, or string them together for a garland. Make them in every fall color, brown, orange, yellow, and red, or you can make sets for different parts of the year, with pastels for spring and bright, bold colors for summer. Winter colors can be red, green, white, gold, and silver. Studio Knits has a free, easy pattern that is accessible to any level of knitter. 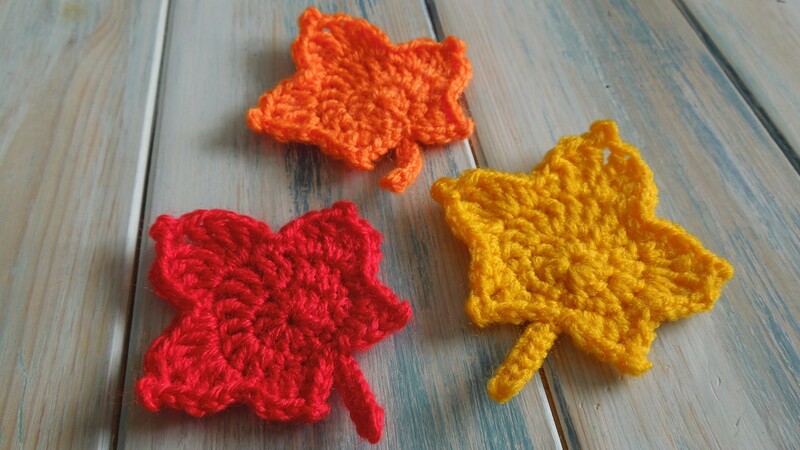 The leaf shape is easy to make larger or smaller (just increase or decrease as needed), and you can use any yarn or color to match your other fall decor. If you subscribe to Studio Knits, then you already have a leg up because they have walked through the stitches needed for this pattern. If you’re feeling a mite unsure, you can also watch their video tutorial on YouTube for helpful pointers. 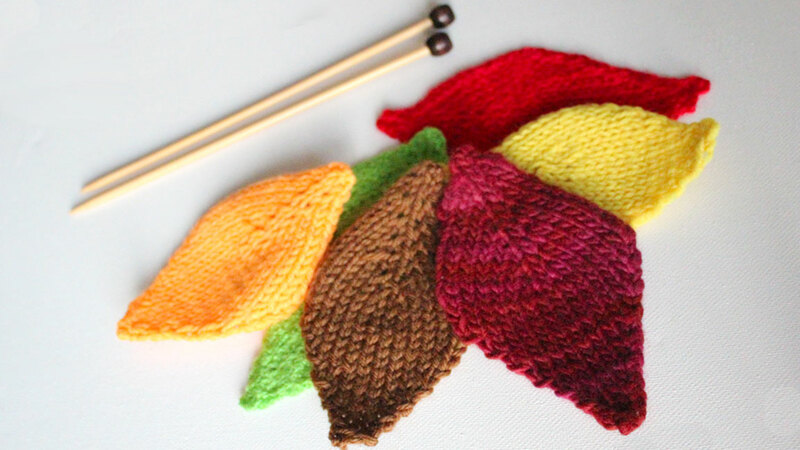 To make your own leaves, you’ll need to collect the following from your craft space: yarn, knitting needles (make sure they are the right size for the yarn you’re using. There are helpful charts online in case you need to double check), a tapestry needle, and a pair of scissors. It is noted in the video tutorial that size 8 knitting needles and worsted yarn are used, but that’s just a suggestion. 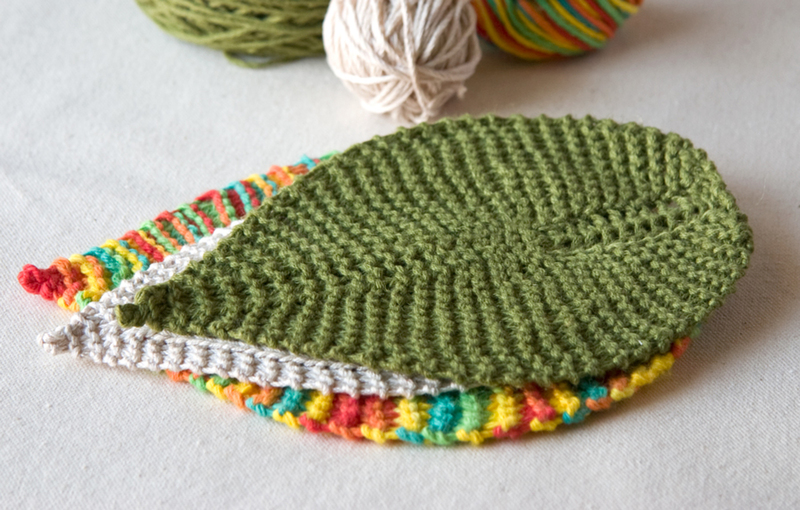 If you want to use chunky yarn to make a large leaf rug, just make sure you have the coordinating size knitting needles handy. As for the techniques needed to make one of these, you’ll need to know how to cast on with the long tail method, knit, purl, make a slip knot, SSK (slip, slip, knit), knit two together (k2tog), and bind off. Even though I’m a beginner knitter, I know most of these already, so don’t be afraid to stretch your skills a little if you’re just starting out. 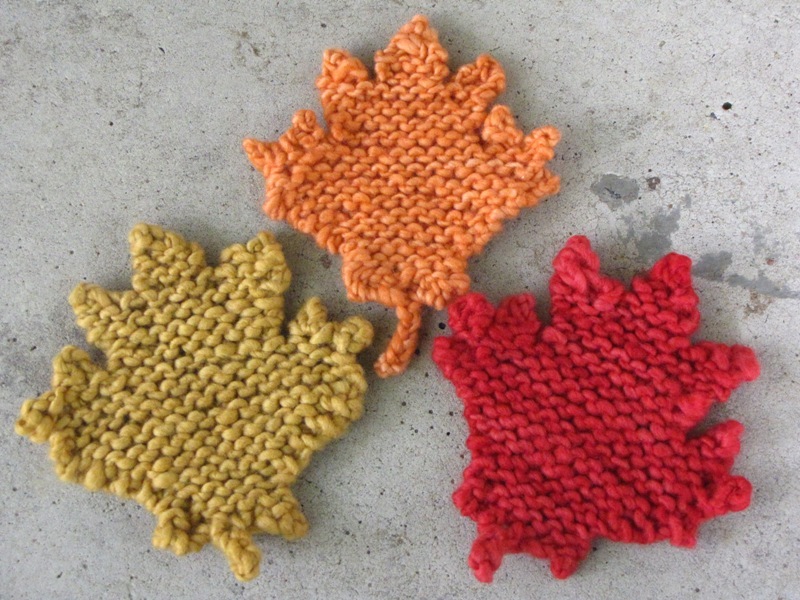 Depending on how you want the finished product to look, you can either let the leaves do as they will, which results in a curling up of the ends and looks particularly fall-like, or you can steam the leaves so that they lie flat, which will be better if you’re using them as trivets, coasters, placemats, and the like. There are instructions included on how to steam the finished leaves. Want to add these to your fall decor collection? You can find the free pattern, video tutorial, and photos on Studio Knits.